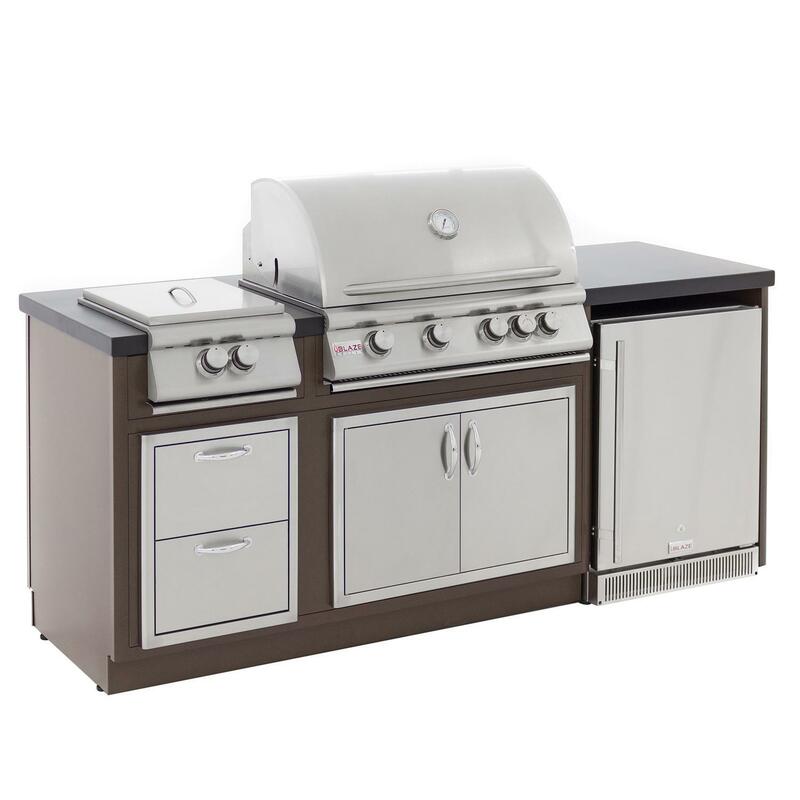 Product Description: Blaze BBQ Island With 32-Inch 4-Burner Natural Gas Grill & Power Burner. Enjoying outdoor kitchen grilling and entertaining has never been easier than with the Blaze BBQ Island package. Featuring lightweight, all-aluminum construction with a welded frame for durability, the Blaze BBQ island is light enough for two people to easily install and set up! Low-maintenance and rust free, the textured black countertop and copper vein finish island panels are powder coated inside and out. Adjustable feet allow for leveling the island and rear ventilation grills ensure adequate airflow to prevent gas and heat buildup. This BBQ island package includes a Blaze 32-inch built-in gas grill with four 14,000 BTU 304 cast stainless steel burners, for a total of 56,000 cooking surface BTUs, a 10,000 BTU infrared rear burner, 748 square inches of cooking space, push and turn flame-thrower primary ignition, a removable warming rack and stainless steel heat zone separators that allow for different cooking zones across the grilling surface. A flame stabilizing grid minimizes flare-ups and the full-width drip tray makes clean up a breeze. The 304 stainless steel grill hood is double-lined to protect the outer layer from heat discoloration. Enjoy versatile cooking options with an included built-in Blaze power burner with cover, featuring a cast stainless steel double ring burner with individual control knobs, allowing you to go from a slow simmer using the 25,000 BTU inner-burner, heating skillets and pans with the 35,000 BTU outer-burner and boiling or frying at high temperatures using both. A stainless steel guard surrounding the burner protects it from drafts and concentrates heat for maximum efficiency. The removable 9-inch inner ring allows for cooking with a wok. Keep fresh ingredients and cool beverages on-hand with the Blaze 24-inch 5.2 cubic foot compact refrigerator. UL-rated safe for outdoor use, this compact fridge features a stainless steel cabinet and reversible door with a full-length professional handle, a door lock for security and child safety, three adjustable and removable chrome shelves, a digital thermostat, fan-forced cooling, cool blue LED interior lighting, adjustable leveling legs and front ventilation for safe built-in use. Easily access your BBQ island interior with 304 stainless steel Blaze double access doors, these quality outdoor kitchen access doors are double-lined, accented with curved handles and feature a convenient paper towel holder inside the right door. The fully-enclosed Blaze double access drawer features an easy close assist and smooth, heavy duty sliding mechanisms, making them great for storing all your BBQ tools and utensils. The Blaze BBQ Island and built-in components are delivered on two separate pallets, allowing for easier setup.